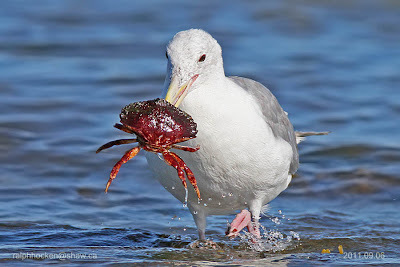 Glaucous-winged Gull: Ralph Hocken Photo. The Sunday bird walk went to Buttertubs Marsh in Nanaimo. The morning was cloudy with calm winds. The highlights included seeing a Eurasian Wigeon in with American Coots when we first arrived at the marsh. Six Gadwall were seen swimming with American Widgeon. Five Trumpeter Swans flew over head. A Northern Shrike flew low over us and landed on the top of tree just off the trail giving us great views. The big surprise of the morning was the sighting of Ruddy Duck on the water as we neared the end of the walk. Trumpeter Swans, Canada Geese, Mallard, Hooded Merganser, Common Merganser, Eurasian Wigeon, American Wigeon, Gadwall, Wood Duck, Ruddy Duck, Ringed Necked Duck, American Coot, Pied-billed Grebe, Bald Eagle, Merlin, Cooper’s Hawk, Northern Shrike, Great Blue Heron, Glaucous-winged Gull, Northern Flicker, Rock Pigeon, Eurasian Collared Dove, Band-tailed Pigeon, American Robin, Ruby-crowned Kinglet, Chestnut-backed Chickadee, Brown Creeper, Steller’s Jay, Common Raven, Marsh Wren, Bewick’s Wren, Spotted Towhee, Fox Sparrow, Song Sparrow, Golden-crowned Sparrow, Red-winged Blackbird, Brewer’s Blackbird, Dark-eyed Junco, House Finch and House Sparrows. Over 150 Pine Siskins are visiting feeders along Lancashire Avenue in Nanaimo. The Tuesday bird walk went to Columbia Beach. The morning was clear and cool with calm winds. Two Trumpeter Swans flew high overhead to start the morning off. We saw Surf Scoters, White-winged Scoters, Black Scoters and our first sighting of the season of a Long-tailed Duck. There were Pacific Loons in breeding plumage, a large number of Horned Grebes and Red-necked Grebes. One lone Western Grebe was not far off shore. Further off shore we saw a long line covering miles of an estimated 1.5 million gulls that including Bonaparte's Gulls, Mew Gulls, Ring-billed Gulls, California Gulls, Thayer's Gulls and Glaucous-winged Gulls. They were in a hugh feeding frenzie--an awesome sight through the scopes as the sun shone down on them. Near the Pebble Beach gravel bar, close to shore, three Sea Lions put on a spectacular show as they fed on salmon. Spotted Towhee, Savannah Sparrow, Song Sparrow, White-crowned Sparrow, Golden-crowned Sparrow, Dark-eyed Junco, Purple Finch, House Finch and House Sparrow. Thursday, November 10 at 7 pm. Guest Speaker-- Nick Raeside will speak on “The Use of Fire as a Forest Management Tool. Monday, November 28 at 7:30 pm. Everyone is invited to join us for a 2-3 hour bird walk on the Sunday and Tuesday mornings. We leave from the Store at 9 A.M. Sunday Mornings and go to a different location in and around Nanaimo and from the Parksville Beach Community Park at 9 A.M. on Tuesdays and go to different areas in and around the Oceanside area. 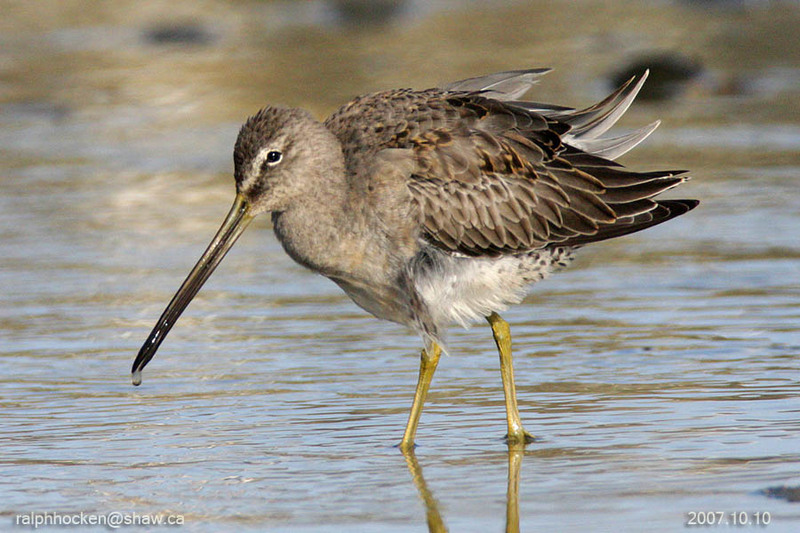 The Tuesday Bird Walk on November 01 will be going to the Little Qualicum River Estuary in Qualicum Beach. We will meet at Parksville Community Park at the parking lot near the Lions Playground at 9:00 A.M. or at viewing platform near Garrett Road and Highway 19a at about 9:15A.M. The Sunday Bird Walk on November 6 will be going to Neck Point Park in Nanaimo. We will meet at the Birdstore at 9:00 A.M. or at the parking lot at Neck Point Park, off Hammond Bay Road at about 9:20 A.M.
Come join us on Saturday, November 12 at the Coast Bastion in Nanaimo for "A Night in Brazil" charity dinner and silent auction for the BC Purple Martin Recovery Program. We are celebrating the most successful year of the 25-year nest box recovery program (730 pairs up from 5 pairs in 1985) and the fall migration of our Purple Martins to SE Brazil, a 11,000 km trip one way as well as raising funds for the 2012 recovery program. Tony Ransom, retired geologist and current President of the Nanoose Naturalists, on " A Tour of Brazil's Pantanal - the World's Largest Freshwater Wetland"
Mike Yip, well known Bird Photographer, on "Migratory Birds on Vancouver Island"
No Host Bar at 5 pm with a buffet dinner at 6 pm. Tickets: $60/person (includes a $23 donation) available at the Backyard Wildbird and Nature Store in Nanaimo or by emailing Charlene at gbears@island.net. Advance purchase of tickets required. The Tuesday bird walk went to Columbia Beach. The morning was clear and cool with calm winds. Two Trumpeter Swans flew high overhead to start the morning off. We saw Surf Scoters, White-winged Scoters, Black Scoters and our first sighting of the season of a Long-tailed Duck. There were Pacific Loons in breeding plummage, a large number of Horned Grebes and Red-necked Grebes. One lone Western Grebe was not far off shore. Further off shore we saw a long line covering miles of an estimated 1.5 million gulls that including Bonaparte's Gulls, Mew Gulls, Ring-billed Gulls, California Gulls, Thayer's Gulls and Glaucous-winged Gulls. They were in a hugh feeding frenzie--an awesome sight through the scopes as the sun shone down on them. Near the Pebble Beach gravel bar, close to shore, three Sea Lions put on a spectacular show as they fed on salmon. The Sunday bird walk went to Rathtrevor Provincial Park in Parksville. The morning was mostly sunny but cool with only calm winds. The highlights included seeing a Townsend’s Warbler with a flock of Pine Siskins. Cedar Waxwings and Purple Finch were in the same bushes. We saw a large flock of Varied Thrush feeding on berries and a Steller’s Jay, with the usual attitude of a jay, flew overhead. American Wigeon, Mallard, Northern Pintail, Surf Scoter, White-winged Scoter, Red-breasted Merganser, Pacific Loon, Common Loon, Horned Grebe, Red-necked Grebe, Doubled-crested Cormorant, Bald Eagle, Peregrine Falcon, Sharp-shinned Hawk, Great Blue Heron, Mew Gull, California Gull, Glaucous-winged Gull, Black Oystercatcher, Townsend’s Warbler, Northern Flicker, Steller’s Jay, Common Raven, Chestnut-backed Chickadee, Red-breasted Nuthatch, Bewick's Wren, Golden-crowned Kinglet, Ruby-crowned Kinglet, Varied Thrush, American Robin, European Starling, Cedar Waxwing, Spotted Towhee, Fox Sparrow, Lincoln’s Sparrow, Song Sparrow, Golden-crowned Sparrow, Dark-eyed Junco, Purple Finch, House Finch and Pine Siskin. A Townsend’s Warbler was spotted at the Little Qualicum Village. Six Greater White-fronted Geese were seen on Craig Bay Pond in Parksville. Four Greater White-fronted Geese and one Snow Goose were seen at Parksville Bay in Parksville. The Tuesday bird walk went to Rathtrevor Provincial Park in Parksville. The morning started off cool and foggy but the fog lifted and let the sun shine on the birds and the birders. A Merlin perching on the top of a tall Fir Tree greeted us near the parking lot. A large flock of American Robins were feasting on a berry bush near the trail. A Herring Gull was just off shore. A large flock of Pacific Loons, Common Loons, several Horned Grebes and Red-necked Grebes and two Western Grebes were further off shore. We saw Golden-crowned Kinglets, Ruby-crowned Kinglets and Cedar Waxwings in the bushes just off the trail. Canada Geese, American Wigeon, Mallard, Northern Pintail, Green-winged Teal, Greater Scaup, Harlequin Duck, Surf Scoter, White-winged Scoter, Common Merganser, Red-breasted Merganser, Pacific Loon, Common Loon,Horned Grebe, Red-necked Grebe, Western Grebe, Pelagic Cormorant, Bald Eagle, Merlin, Mew Gull, California Gull, Herring Gull, Glaucous-winged Gull, Pigeon Guillemot, Northern Flicker, Pileated Woodpecker, Northwestern Crow, Common Raven, Chestnut-backed Chickadee, Red-breasted Nuthatch, Brown Creeper, Bewick's Wren, Golden-crowned Kinglet, Ruby-crowned Kinglet, American Robin, European Starling, Cedar Waxwing, Spotted Towhee, Fox Sparrow, Song Sparrow, Golden-crowned Sparrow, Dark-eyed Junco, Purple Finch, House Finch and Pine Siskin. A White Throated Sparrow was seen visiting feeders along Pilot Way in Nanoose Bay. There was a confirmed report of a female or immature Lark Bunting at Jordan River, on the west side of Vancouver Island. Lark Buntings are usually seen in the southern prairies in North America and are an unusual species for this area. A Barred Owl, a Belted Kingfisher, a Steller’s Jay, a Bald Eagle and a flock of Northern Pintail were seen at Spider Lake. Monday, October 24 at 7:30 pm. Guest speaker-- Faye Smith will bring us up to date on the current projects and findings of the Mid Vancouver Island Habitat Enhancement Society. The Sunday Bird Walk on October 30 will be going to Buttertubs Marsh in Nanaimo. We will meet at the Birdstore at 9:00 A.M. or at the parking area at Buttertubs Marsh off Bowen Road at about 9:20 A.M.
Eurasian Wigeon: Ralph Hocken Photo. The Sunday bird walk went to Nanoose Bay Estuary. The morning was mostly sunny with calm winds, giving us a very pleasant walk. 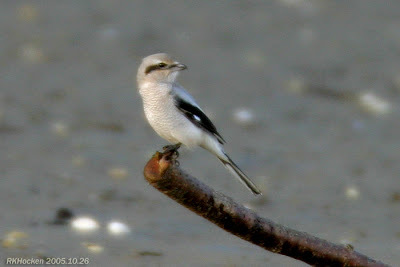 The highlights included seeing a Northern Shrike several times during the morning. We saw an Eurasian Wigeon behind a flock of Canada Geese. As we watched, the Wigeon swan past the Geese giving us good views. Canada Geese, Mallard, American Wigeon, Eurasian Wigeon, Northern Pintail, Green-winged Teal, Surf Scoter, White-winged Scoter, Black Scoter, Greater Scaup, Common Merganser, Common Loon, Pacific Loon, Horned Grebe, Red-necked Grebe, Double-crested Cormorant, Pelagic Cormorant, Great Blue Heron, Killdeer, Bald Eagle, Merlin, Red-Tailed Hawk, Northern Shrike, Mew Gull, California Gull, Glaucous-winged Gull, Belted Kingfisher, Golden-crowned Kinglet, Ruby-crowned Kinglet, Chestnut-backed Chickadee, Northern Flicker, Northwestern Crow, Common Raven, American Robin, European Starling, Savannah Sparrow, Song Sparrow, Fox Sparrow, Golden-crowned Sparrow, Spotted Towhee, Purple Finch, Dark-eyed Junco, Red Crossbill and American Goldfinch. Common Loons, Harlequin Ducks, Black Oystercatchers and Black Turnstones were seen on the beach at Qualicum Beach. Anna’s Hummingbird, White-crown Sparrows, Bewick’s Wren and Eurasian Collared-Doves were seen in a backyard along Glenayr Drive in Nanaimo. A Ruddy Duck was seen at Morningstar Ponds in French Creek. Three Cackling Geese were seen in with Canada Geese at Morningstar Ponds in French Creek. One Snow Goose was spotted on the grass at Parksville Bay Community Park in Parksville. A Greater White-fronted Goose was seen at Parksville Bay Community Park in Parksville. Twenty American Goldfinch are visiting backyard feeders along Lancashire Avenue in Nanaimo. A Steller’s Jay was spotted at Buttertubs Marsh in Nanaimo. The Tuesday bird walk went to the Shelly Road side of the Englishman River Estuary in Parksville. The morning was partly cloudy with lots of sun and calm winds making for a very pleasant morning for a bird walk. A flock of over fifty Brant Geese flew past us heading down the Strait of Georgia. We spotted a Black-bellied Plover, a Pectoral Sandpiper and two Long-billed Dowitchers feeding on the edge of a sand bar near the ocean. A male Northern Harrier was spotted perched on a stump and he gave us good looks through the scope. We watched as he left his perch and dropped down to picked a rodent up in it's talens. We also had great looks at a Northern Shrike perched at the top of a bush not far from the viewing tower. Northwestern Crow, Common Raven, Chestnut-backed Chickadee, Red-breasted Nuthatch, Brown Creeper, Bewick's Wren, Pacific Wren, Golden-crowned Kinglet, Ruby-crowned Kinglet, American Robin, European Starling, Cedar Waxwing, Spotted Towhee, Savannah Sparrow, Song Sparrow, Golden-crowned Sparrow, Dark-eyed Junco, Brewer's Blackbird, Purple Finch, House Finch, Pine Siskin and American Goldfinch. Hundreds of Snow Geese were spotted over the Morningstar ponds, heading east towards Parksville. A White-throated Sparrow was seen at Piper’s Lagoon in Nanaimo. Eleven Greater White-fronted Geese were seen from Northwest Bay Road at the Nanoose Bay Estuary in Nanoose Bay. 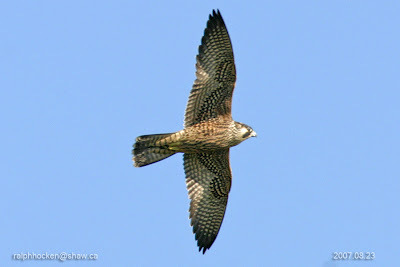 A Merlin was seen perched in the Eagle Tree at Nanoose Bay. A Lapland Longspur, in winter plumage, was seen behind the Church Camp at Nanoose Bay. @ The Library Centre along Northwest Bay Road, Nanoose Bay. The Tuesday Bird Walk on October 18 will be going to Rathtrevor Provincial Park in Parksville. We will meet at Parksville Community Park at the parking lot near the Lions Playground at 9:00 A.M. or at the main parking near the beach at Rathtrevor Park at about 9:10 A.M. The Sunday Bird Walk on October 23 will be going to Rathtrevor Provincial Park in Parksville. 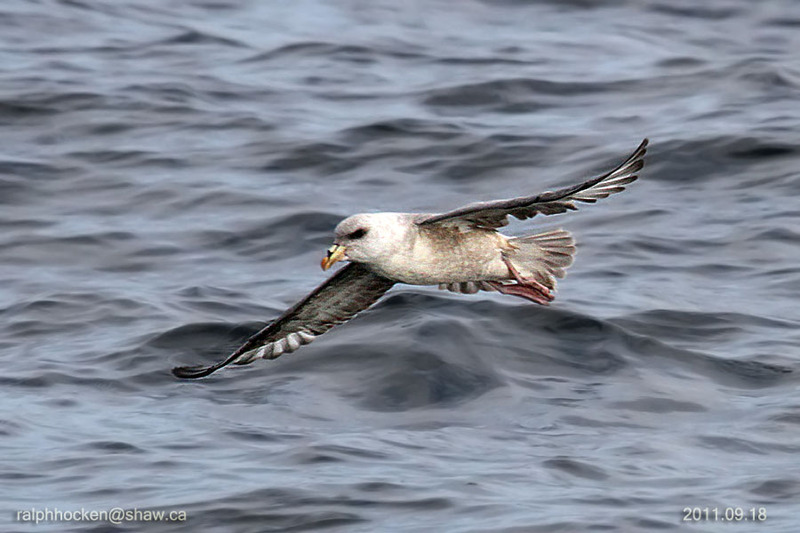 We will meet at the Birdstore at 9:00 A.M. or at the main parking near the beach at Rathtrevor Park at about 9:30 A.M. The Tuesday bird walk went to the Shelly Road side of the Englishman River Estuary in Parksville. The morning was partly cloudy with lots of sun and calm winds making for a very pleasant morning for a birdwalk. A flock of over fifty Brant Geese flew past us heading down the Strait of Georgia. We spotted a Black-bellied Plover,a Pectoral Sandpiper and two Long-billed Dowitchers feeding on the edge of a sand bar near the ocean. A male Northern Harrier was spotted perched on a stump and he gave us good looks through the scope. We watched as he left his perch and dropped down to picked a rodent up in it's tallans. We also had great looks at a Northern Shrike perched at the top of a bush not far from the viewing tower. The Sunday bird walk went to Nanaimo River Estuary in south Nanaimo. The morning was mostly sunny and with no winds, giving us a very pleasant walk. The highlights included seeing a large numbers of sparrow species. Song Sparrows, Golden-crowned Sparrows, White-crowned Sparrows, Fox Sparrows, Savannah Sparrows, Lincoln’s Sparrows and Dark-eyed Juncos were in great abundance. We spotted a Western Meadowlark perched on a bush over the estuary. A Northern Harrier was flying low over the grass, hunting rodents, for most of the morning. 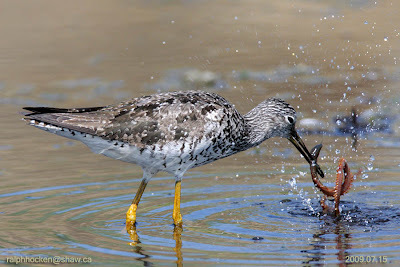 A Greater Yellowlegs was on a gravel bar near the viewing tower and was joined there by a Lesser Yellowlegs giving us a good comparison between the two. Canada Goose, Great Blue Heron, Green-winged Teal, Northern Pintail, Common Merganser, Bald Eagle, Cooper’s Hawk, Merlin, Northern Harrier, Osprey, Killdeer, Greater Yellowlegs, Lesser Yellowlegs, Ring-necked Pheasant, California Gull, Glaucous-winged Gull, Northern Flicker, Downy Woodpecker, Western Meadowlark, Northwestern Crow, Common Raven, Red-winged Blackbirds, Bewick’s Wren, Chestnut-backed Chickadee, Spotted Towhee, Song Sparrow, Golden-crowned Sparrow, White-crowned Sparrow, Fox Sparrow, Savannah Sparrow, Lincoln’s Sparrow, Dark-eyed Junco, Purple Finch and House Finch. Two Orange-crowned Warblers were seen along Drew Road in French Creek. A Western Screech-Owl was spotted being chased by a Barred Owl in a bush near Northfield Road in Nanaimo. An Orange-crowned Warbler was observed in a yard along the 5300 block of Hammond Bay Road in Nanaimo. A White-throated Sparrow and White-crowned Sparrow were seen at Neck Point Park in Nanaimo. Two Fox Sparrows were seen at feeders in the 5300 block of Hammond Bay Road in Nanaimo. The Tuesday bird walk went to the Little Qualicum River Estuary, just past Qualicum Beach. The morning was cloudy with strong winds off the Strait of Georgia. We saw one Greater Scaup land in with a raft of White-winged and Black Scoters. Three Bald Eagles flew over the estuary, giving rise to a mixed flock of Mallards and American Wigeon. A Western Sandpiper and a Long-billed Dowitcher were feeding along the shore in the estuary with American Wigeon, Green-winged Teal and Northern Pintail. Canada Geese, Mallard, American Wigeon, Northern Shoveler, Northern Pintail, Green-winged Teal, Greater Scaup, Harlequin Duck, Surf Scoter, White-winged Scoter, Black Scoter, Long-tailed Duck, Red-breasted Merganser, Pacific Loon, Common Loon, Horned Grebe, Red-necked Grebe, Double-crested Cormorant, Pelagic Cormorant, Great Blue Heron, Turkey Vulture, Bald Eagle, Killdeer, Black Oystercatcher, Greater Yellowlegs, Black Turnstone, Western Sandpiper, Long-billed Dowitcher, Bonaparte's Gull, Mew Gull, California Gull, Thayer's Gull, Glaucous-winged Gull, Eurasian Collared-Dove, Belted Kingfisher, Northern Flicker, Northwestern Crow, Common Raven, Chestnut-backed Chickadee, Cedar Waxwing, Savannah Sparrow, Song Sparrow, Golden-crowned Sparrow, Dark-eyed Junco, Red-winged Blackbird, House Finch, Pine Siskin, American Goldfinch and House Sparrow. A female Slate-colored Dark-eyed Junco appeared among a growing number of Dark-eyed Junco in the 5300 block of Hammond Bay Road in Nanaimo. 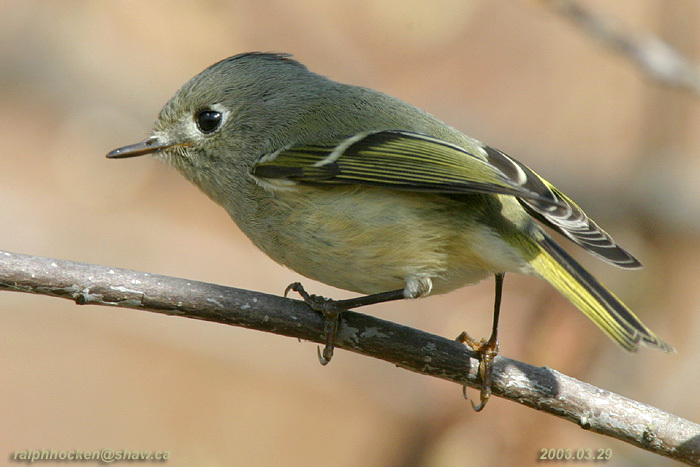 A juvenile Black-throated Gray Warbler and an Orange-crowned Warbler were seen in a backyard in the 5300 block of Hammond Bay Road in Nanaimo. Thursday, October 13 at 7 pm. Guest Speaker, Bill Merrilees, will give a slide presentation about Buttertubs Marsh. 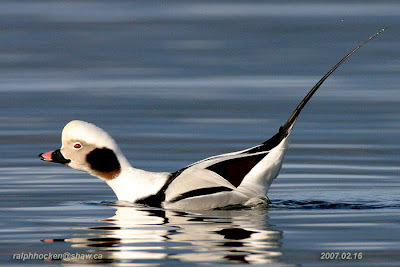 The Tuesday Bird Walk on October 11 will be going to the Englishman River Estuary in Parksville, Shelley Road side. We will meet at Parksville Community Park at the parking lot near the Lions Playground at 9:00 A.M. or at the end Shelly Road and on the Oceanside of Highway 19A at about 9:10 A.M. 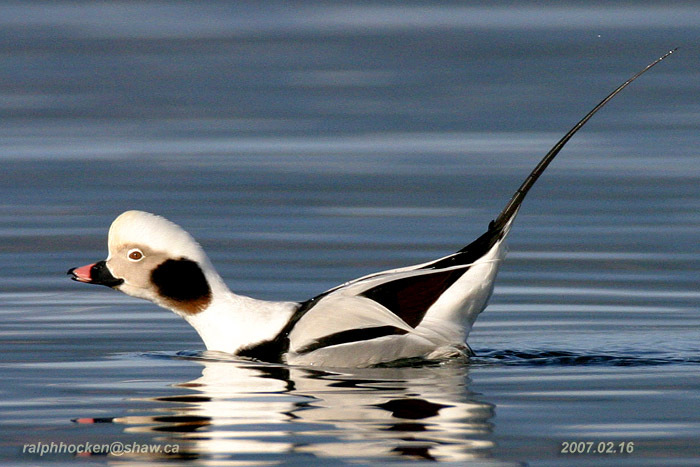 The Sunday Bird Walk on October 16 will be going to Nanoose Bay. We will meet at the Birdstore at 9:00 A.M. or at the beach side of the Church Camp off highway 19 and Arlington Road at about 9:20A.M. Long-billed Dowitcher: Ralph Hocken Photo. Northern Fulmar: Ralph Hocken Photo. The Sunday bird walk went to Neck Point Park in Nanaimo. The morning was cloudy but with no winds, giving us a very pleasant walk. The Strait of Georgia is beginning to come alive with sea birds for the winter. Pacific Loons, in breeding plumage, along with Surf Scoters, Common Mergansers, Red-necked Grebes, Common Loons, Double-crested Cormorant, Pelagic Cormorant, Rhinoceros Auklets, Marbled Murrelets, Pigeon Guillemots and Common Murre were seen on the Strait of Georgia. A Harlequin Duck, Pelagic Cormorants, Great Blue Heron and the resident Spotted Sandpiper were seen just off shore. Mallard, Harlequin Duck, Surf Scoter, Common Mergansers, Red-necked Grebe, Common Loon, Pacific Loon, Double-crested Cormorant, Pelagic Cormorant, Great Blue Heron, Spotted Sandpiper, Turkey Vulture, Osprey, Bald Eagle, Merlin, Surfbirds, Mew Gull, California Gull, Glaucous-winged Gull, Western Gull, Bonaparte's Gull, Rhinoceros Auklet, Marbled Murrelet, Pigeon Guillemot, Common Murre, Northern Flicker, Pileated Woodpecker, Downy Woodpecker, Northwestern Crow, European Starling, Anna’s Hummingbird, Belted Kingfisher, Yellow Warbler, Hutton’s Vireo, Bewick's Wren, Brown Creeper, Chestnut-backed Chickadee, Golden-crowned Kinglet, American Robin, Spotted Towhee, Savannah Sparrow, Song Sparrow, House Finch and Dark-eyed Junco. A Sooty Grouse was seen along the top of Westwood’s Ridge Trail behind Westwood Lake in Nanaimo. Twenty-six American Goldfinch, twelve House Finch, one Bewick's Wren, two Anna's Hummingbirds and a Dark-eyed Junco were seen visiting feeders along Lancashire Avenue in Nanaimo. A Savannah’s Sparrow, Western Gull and Thayer’s Gulls were seen at Piper’s Lagoon in Nanaimo. A Hump-back Whale was seen off Neck Point Park in Nanaimo. The Tuesday Birdwalk went to Columbia Beach. The morning was mostly cloudy with a little rain and the winds were mostly calm. The highlight of the morning was the sighting of three flocks of Greater White-fronted Geese. Three of the Greater White-fronted Geese flew so low over us that we could see their speckled bellies. They circled around us as if they were going to land but they changed their minds and continued to fly into the eastern sky. A flock of forty Greater White-fronted Geese flew past high overhead heading straight south. We spotted a Common Murre, two Pigeon Guillemots and a Marbled Murrelet riding the waves on the water. Greater White-fronted Goose, Mallard, Northern Shoveler, Northern Pintail, Green-winged Teal, Harlequin Duck, Surf Scoter, White-winged Scoter, Common Merganser, Red-breasted Merganser, Pacific Loon, Common Loon, Horned Grebe, Red-necked Grebe, Western Grebe, Double-crested Cormorant, Pelagic Cormorant, Great Blue Heron, Turkey Vulture, Bald Eagle,Cooper's Hawk, Merlin, Black-bellied Plover, Killdeer, Black Oystercatcher,Spotted Sandpiper, Black Turnstone, Bonaparte's Gull, Mew Gull, California Gull, Herring Gull, Thayer's Gull, Western Gull, Glaucous-winged Gull, Common Murre, Pigeon Guillemot, Marbled Murrelet, Eurasian collared-Dove, Northern Flicker, Northwestern Crow, Chestnut-backed Chickadee, American Robin, European Starling, Spotted Towhee, Song Sparrow, White-crowned Sparrow and Golden-crowned Sparrow. A small flock of Sandhill Cranes seen were feeding in a field in Errington. A flock of Sandhill Cranes were spotted flying over Qualicum Beach. General Meeting @ Springwood Middle School, Parksville. The Tuesday Bird Walk on October 04 will be going to the Little Qualicum River Estuary in Qualicum Beach.. We will meet at Parksville Community Park at the parking lot near the Lions Playground at 9:00 A.M. or at the viewing platform near Garrett Road and Highway 19A at about 9:20 A.M. 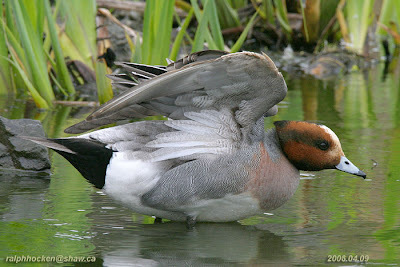 The Sunday Bird Walk on October 09 will be going to the Nanaimo River Estuary in Nanaimo. We will meet at the Birdstore at 9:00 A.M. or at the end of Raines Road at about 9:30A.M.